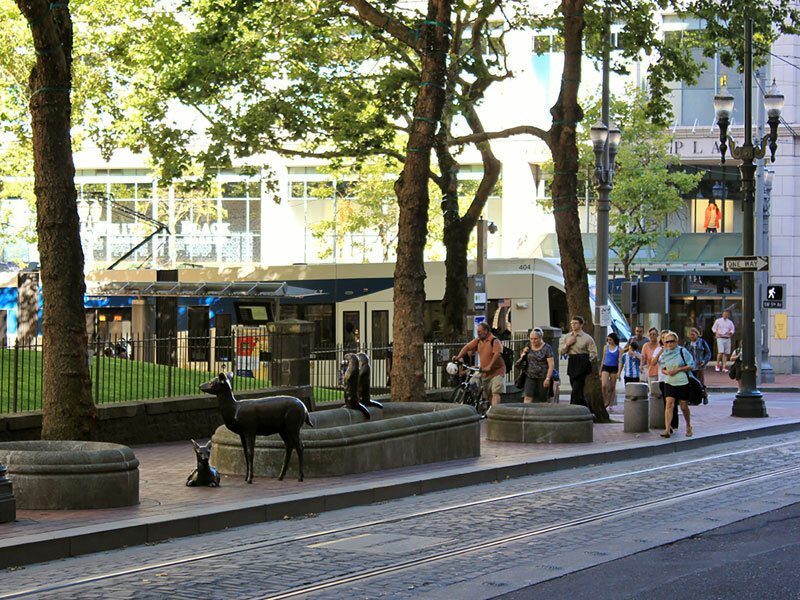 The Portland Transit Mall is a unique 1.2-mile couplet of one-way streets — 5th and 6th Avenues — that lie at the cultural and economic center of Portland. It traverses six districts of downtown Portland including Old Town, Chinatown, and Portland State University, and has 116 block faces housing businesses, hotels, nonprofits, urban housing, and educational institutions. 57 blocks along 5th and 6th Avenues from NW Irving Street to SW Jackson Street. Portland Mall blocks host a variety of uses after the successful completion of the Portland Mall Revitalization Project. Photo by Bruce Forster. The original mall was a transportation project built in 1978. 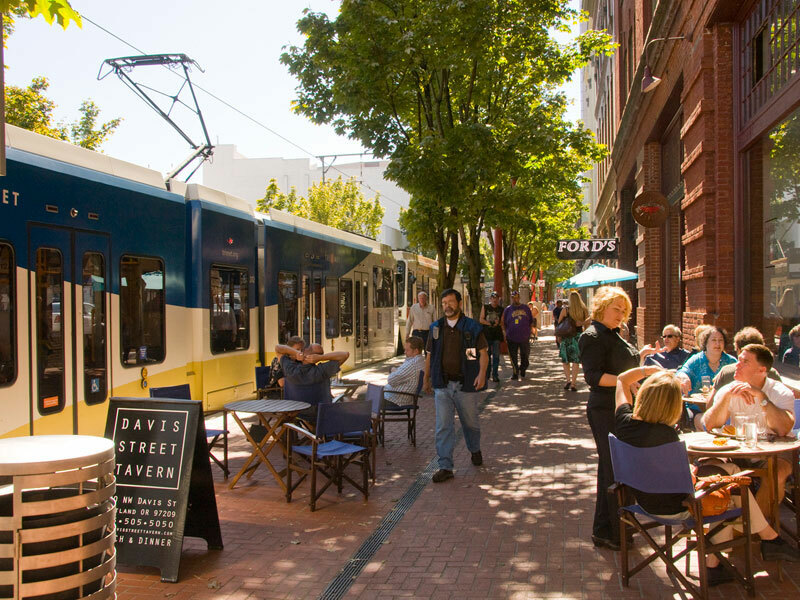 The idea for the transit mall was born out of Portland's 1972 Downtown Plan. Portland was losing residents, investment, and employment to the suburbs. The plan was simple but firm in its vision — downtown should not be reconfigured to accommodate automobiles, parking should be restricted, transit should be enhanced, and downtown should be a pleasant place to work, live, play, and visit. From this idea, a bold initiative emerged: conversion of the city's prime commercial 5th and 6th Avenues into a pedestrian- and transit-oriented corridor. The original Portland Mall transformed the perception of downtown with its wide brick sidewalks, majestic trees, and its custom-designed furnishings and amenities. 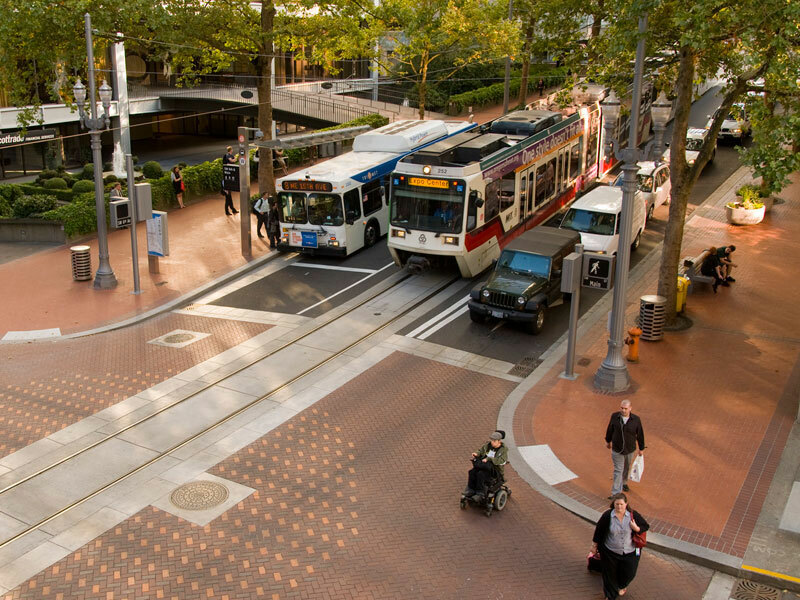 It became one of the country's most used bus transit corridors and marked a cultural shift in Portland, embracing transit and pedestrian mobility as a lifestyle choice. Over time, the physical attributes of the mall have taken on an iconic status and appear in visitor literature and commercial branding for city center information. In 2009, the Portland Mall Revitalization Project was completed to preserve and renovate the mall's treasured features yet adapt it for a different, more mature urban population. Improvements included the addition of a light rail alignment along 5th and 6th Avenues. New light rail stations were added and bus stops were repositioned. A through travel lane was integrated into the right-of-way while preserving the wide pedestrian zones. New shelter architecture, signs, seating, and street furnishings were added to refresh and update the original design. The project successfully improved the region's transit core and enhanced vitality along the entire length of 5th and 6th Avenues. Public art along the transit mall. Photo courtesy City of Portland Bureau of Planning and Sustainability. The revitalized Portland Mall includes intermittent bus stops and light rail stations, with transit traveling in the center lane between stops and stations. Photo by Bruce Forster. All five of the region's light rail lines as well as the busiest, frequent service bus routes, converge at the mall, making connections to any point in the metropolitan area.